Endless Villas bespoke services aim to satisfy the individual needs of residents and guests. Our on-site management team can assist with ‘a la carte’ services including housekeeping, babysitting, Thai massage, cooking and transportation as well as tailor made services such as private parties and sightseeing tours. The housekeeping team provide convenient cleaning services as often as you choose such as daily or weekly servicing. We can give you access to a selection of boats, the perfect way to travel to enjoy the amazing scenery of the Andaman Sea. The yacht can accommodate different numbers of guest for maximum comfort. Enjoy a day trip of sightseeing, swimming and snorkelling in style and stop for lunch on a private island such as Khai Nui, with everything you need on board from refreshments to snorkelling gear. All villas have private parking spaces, but to minimise traffic and to make life easy we also provide a complimentary shuttle service to get around the estate. To explore the island we have a VIP van plus a chauffeur driven car available for guests to use. We can also arrange car hire, airport transfers and reliable taxi drivers. There are many must-see attractions in and around Phuket that we highly recommend such as a boat trip to Phang Nga Bay and Phi Phi Island, spectacular cultural shows and Phuket Old Town to name just a few. We can also make reservations at the best fine dining restaurants, championship golf courses and book you into a luxury spa for a day of pampering. Each villa has a fully equipped kitchen, however if you prefer not to prepare meals during your stay we can do it for you. Breakfast, lunch and dinner can be arranged at the clubhouse or we can deliver to your private villa. For ultimate convenience a personal cook can prepare everyday meals, special occasion dinners or poolside barbecue parties at your villa. Impress your friends with a stylish party in one of the most stunning and private locations in Patong. 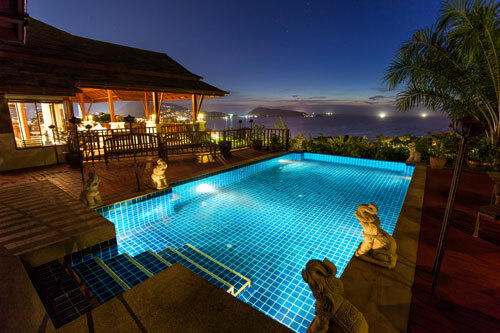 The clubhouse and main pool set upon the hillside have a wide poolside area for dining and dancing with a stunning backdrop of glittering city lights and the deep dark sea. Whether you prefer a casual in-villa barbecue or big themed party, our team can arrange everything from the DJ setup to food and beverage leaving you to relax and enjoy the party.